The Corner of Fulton and Mariposa was very important since the very beginning (1872) of Fresno’s growth. The first recorded sale of this property was on April 1875 for the price of $187.50 and was sold later that year for $550.00. Small wooden shacks, which were occupied by photographers, carpenters, and millinery shops and ice cream parlors were rapidly constructed on the site. A San Francisco capitalist, Charles G. Hutchinson, purchased the corner in 1883 for $12,000 and built the two story Hutchinson Building with a grand corner tower. In 1888 the building was sold to Fresno Loan and Savings Bank for $46,000 , who added two more stories to the building along with an elevator(Fresno’s second elevator). In 1912, the four story Hutchinson Building was purchased for $65,000 and by 1916 was sold for $152,000 to the Bank and Trust Company of Central California. They later merged with Farmer’s National Bank and changed the building’s name to Fidelity Trust and Savings Bank. In 1922, the building sold and became the Fidelity Branch of the Los Angeles Trust and Savings Bank, but it soon changed its name to the Pacific Southwest Trust and Savings Bank. In March, 1923, demolition of the original Hutchinson Building had started and by June 5, 1923, excavation had begun. 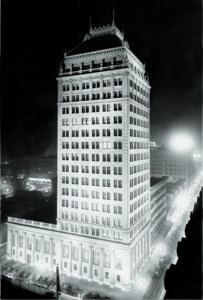 By October, 1924, the upper floors of the Pacific Southwest Building were ready for tenants and on January 19, 1925, the R.F. Felchin designed building was opened to the public. The Pacific Southwest Building was and still is the tallest building between Los Angeles and San Francisco and was constructed ahead of it’s time with the use of steel reinforced concrete. Twelve hundred tons of steel, which cost $141,000.00, went into the construction of the frame. Terra cotta and faced brick cover the building’s exterior with 492 tons of Granitex from Gladding, McBean and Company. While the roof is covered with a combination of Italian bottom pan tile and Mission top tile, the crown on the very top is constructed of galvanized iron. Originally, there was a flagpole with a huge revolving light 315 feet above the sidewalk. The beacon was intended to warn farmers within a thirty mile radius of frost and storm warnings and to guide airplanes to the airport. This flagpole has since been replaced with a sturdy steel antenna which houses communication equipment along with the still present airplane beacon. This impressive skyscraper was the most expensive building built in California between 1920 and 1930. The interior Architecture is Italian Renaissance with walls of Tennessee Walnut marble embellished with Bottocino marble. The main Bank Lobby (Currently a beautiful Ballroom) exhibits imitation stone walls with a highly decorated and gold gilded (original cost of $6,000 for the non-tarnishing gold) coffered ceilings. The woodwork is African Ribbon Mahogany, which currently is an extremely rare and expensive wood. Steel grated doors and 18 inch reinforced concrete walls lined with steel, guard the basement which housed the Bank’s six vaults. The main vault housed 3,050 safety deposit boxes and was protected by an incredible 24 inch thick steel vault door, which weighs 60,000 pounds. R.F. Felchlin and architects Raymond R. Shaw and Charles H. Franklin made a special trip to New York to study the newest designs in office buildings and bank structures. Shaw scanned the skyline of New York from his hotel window for inspiration which he embodied in the beautiful Pacific Southwest Building. For many years at night during Easter Week, the lights in appropriate offices are lit so that a huge cross appears on each of the three sides of the building and Fresno’s highest electrical tree is lit up over the Christmas Holidays high atop the building. Generations of Central Valley residents identify the Pacific Southwest Building as not only being the center of Fresno; but also, the icon representing their “home”.